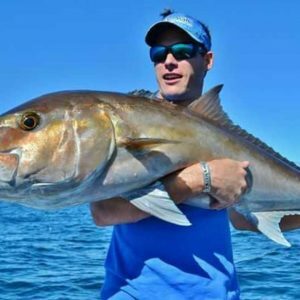 Fishing started off for Adam at an early age, spending most weekends standing next to his dad on the beach catching the usual species along the local beaches in the Port Stephens area. Things evolved from there, pretty quickly realizing he wanted to challenge himself further in catching the same species on smaller, lighter tackle, testing himself and the gear to its limits. From this, he sustained this motivation into adulthood and still chase the next level fishing thrill. Once old enough to get out and about with his mates, Adam fished the local rivers hard for bass whenever he had a chance, even leaving school early one day around exam time for one of the most insane river bass sessions ever, catching 60 plus fish in a few hours, breaking the 50, 60 and a few days later the 70cm mark! Adam says this is a fishing history that he will never ever forget, shared with a couple of good mates. From there the variety and species grew with age and the greater ability to get to new locations. He had a few years on the stones watching floats for black fish in the winter and torpedo floats for longtail tuna in the summer. This soon got put to the wayside when he got offered the opportunity to head out on a boat to catch marlin around the age of 20. You would think the hours spent staring at skipping baits and the time laying on deck, crook as a dog and wanting to die from sea sickness would have been a deal breaker. But he was instantly hooked. A chance introduction to a friend’s neighbour over a casual beer – turns out he’s a highly regarded angler in his own right. Being taken under his wing, he quickly developed with a reputation of his own and found himself in the game fishing tournament scene, becoming a respected crew member on a well-known boat with a number of major tournaments wins to his name. The blokes he met during this time of his fishing life, he now regards as close mates and gets back for a tournament whenever he can, as well as competing in those held on the west coast. Adam moved to the mid-west of WA 10 years ago and he found the fishing was unreal! With an already well-established hand in the artificial bait scene from over east with the snapper, the next progression was jigging and the scene was huge over here. Focusing his attention on slower forms of jigging the options are endless, from snapper, dhuies, coral trout and trophy size Samson fish and amberjacks, the diversity of fish and jigging techniques is endless. Lastly, he would like to thank the team at Frogley’s Offshore for making him part of their team and he looks forward to testing tackle and promoting their products over in the wild west.